The government's nuclear inspectors have played down reports of "major cracks" in the reactor cores of some UK atomic power stations. The Guardian reported that safety assessments from April by inspectors had raised "serious questions". 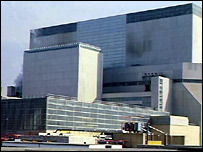 British Energy was reportedly criticised over cracks in its reactors. But it says cracks are "known about and anticipated". Inspectors say "matters have moved on" since April and they are confident of safety at British Energy. The Guardian reported that the inspectors' documents, obtained under the Freedom of Information Act, said the company was unaware of the extent of the damage to its advanced gas-cooled nuclear reactor cores (AGRs), did not fully understand why cracking occurred, and was unable to monitor deterioration. In the documents, inspectors reportedly say the risk of an accident at Hinkley Point B in Somerset - home to two of British Energy's 14 AGRs - is likely to increase with time. An inspector was quoted as saying: "While I do not believe that a large release [of radiation] is a likely scenario, some lesser event ... is, I believe, inevitable at some stage if a vigilant precautionary approach is not adopted. "There is an increased likelihood of increased risk should we agree to continued operation." A spokesman for British Energy said AGR reactor cores were made up of graphite bricks arranged in layers. It was accepted by inspectors and the industry in general that "cracks will occur in some of the bricks as part of the normal ageing process within the graphite reactor core", he added. "This is a phenomenon known about, and anticipated for, within the safety case." He said the documents seen by the Guardian were "only a fragment of the ongoing dialogue that British Energy has with its regulator". Inspections of AGRs take place during "outages" - statutory shutdowns which take place every three years. "We announced in 2004 that increased inspections will be, and have been, undertaken during appropriate statutory outages," the spokesman said. A statement from the Health and Safety Executive (HSE) said: "Matters have moved on since April and British Energy has provided new evidence in support of the reactor core safety case." The HSE praised British Energy for "working on methods to monitor the cores while the reactors are in service". The statement added: "If HSE were not confident in the safety of the reactor cores we would not allow the reactors to operate."